Q. Yesterday you were saying that today's match was a test. Have you passed it, and how would you grade it? RAFAEL NADAL: Well, good, good. I think I played a very all‑round match. I think that maybe two games in the second set didn't do so good. I didn't do the break in the next game where I should have. But afterwards I had a break point, and I just managed to get the ball in the court by just a few centimeters. I think I played well and with good intensity, which is one of the most important things. I managed to avoid his attacks. He didn't attack me. Whenever I attacked, I succeeded. I saved a couple of break points with my serve. So in general, good. The only thing I would say was perhaps that two games in the second set my level was down a little bit. A little bit less intensity. After that, I had the opportunity to dominate the game, and that's all. Sometimes you have to play without taking a lot of risk but throw in some quality shots. In those two games, as I'm saying, I think I had a little bit less quality and perhaps he was able to attack me a little bit more. I was defending and not controlling the game. Normally you have to defend and control. Overall I'm satisfied; I'm happy. I have made it to the semifinals, and I think that's a great result for me, especially after losing in Barcelona the way I did. Very happy about the way things have worked out. I passed a test that was really important for me. Q. Yesterday you were saying that this test was different to the two previous matches. This one was a little bit more complicated. Do you think it was less complicated than you were expecting? RAFAEL NADAL: Well, I don't expect anything. Whenever I go out on the court I always expect the maximum. I know the opponent is one of the best players in the world, and you know that these kind of matches are decided because of small details. The match is decided because of small moments. Well, he also had a break point to go 5‑4 in the second set, and he didn't manage to do that. I think I played a good game overall. Perhaps he committed a few errors. That's where the match changed again. It's true that if it goes 5‑4 or 6‑4, then you have a couple of problems. So 6‑3, 6‑4 is a result that at the beginning you can say it's an easy one, but I think the match is complicated. It was a complicated match. We were playing for an hour and 40 minutes. You can see the time speaks for itself. It was a complicated match. Luckily I had a good day. I think better than the previous one. This is very positive, especially when day after day you go on and give a step forward every single day. Q. At your first press conference we were asking about the favorite playing to win the tournament. You did not include yourself. After today's match do you see yourself more as a favorite? RAFAEL NADAL: Of all the four of them, I'm one of the favorites, of course. Well, now I only know that I have made it to the semifinals. As I said before, it's very positive news talking about the points and winning matches, and especially because of after today's match I played an important opponent. Tomorrow I have another opportunity to play at a really high level. I have to be ready to suffer. No matter who the rival is, you're going to suffer. They smack the ball hard and so you just have to be there. It's just another test for me. I go day by day. Today has been a very positive day, and I'm very happy about that. I try, as I said before, to be happy about the small things that happen. This is not a small thing. This is a big thing. I made it to the semifinals. And making it to the semifinals in a tournament like this where we have all the big players, that's big news. It's my second time I made to the semifinals in Masters 1000 this year, and I normally don't get there. Let's see what happens tomorrow. Q. What has changed from Barcelona? What do you expect tomorrow? RAFAEL NADAL: Well, of course I'm playing a little bit better than in Barcelona. But in Barcelona it seemed that everything was fine. I came from doing a good tournament in Monte‑Carlo, I win the first round against Almagro, and seems I was doing things good. Then I had a really bad day against Fognini. I think nowadays the dynamic is a little bit better. Tomorrow is going to be a very tough match. What do I expect? As always, I just expect to go out there, know that I have to suffer, that if I don't play at really high level I'm not going to have options, and that's the reality. I'll just try to play that level and take my few opportunities that I might have. Q. How do you feel mentally? Today you managed to recover in the second set. Emotionally how do you feel? RAFAEL NADAL: Good, good. Feeling pretty well. RAFAEL NADAL: Emotions are always there. No, I never miss them. After, whenever you don't go for you opportunities, as this year I haven't gone for some important opportunities I've had, well of course maybe you let yourself down a little bit. You're a little bit down some days, and then you just start training and again start looking forward. Once again you fall down, get up, fall down, get up; and then you fall down again. In this sport you always can fall down. Each week there is a lot of players playing at the beginning of the tournament, and only one of them is the one who doesn't lose. I just to have face the situation as I said the first day. Things are not always working out. Many times in my career they worked out and other times they haven't. Nowadays, let's see. I'm just trying my best so that everything works out again for me. I have to win things by my own, and I'm trying to do everything that I can to make things work out for me. Q. Yesterday you said that today was a test. Can you grade it? RAFAEL NADAL: No, no, I don't want to talk about grades. When you win, everything is fine. In the world of sport, unfortunately or not‑‑ I don't know, I don't know what to say‑‑ the result is absolutely everything. The score is everything. In this case, it's not only the score. I managed to play well. I played good tennis. I did the things that I believe that I do when I play well. I wish I had won more matches like this in order to play with a little bit more confidence. Perhaps a moment after the break some of my forehands I could be more aggressive with. But in general, I think that everything has been very positive today. Being realistic, if we didn't come from an irregular path, and we should talk about what has happened here, we could be saying things are fine and everything is perfect and we're going forward. We have to remember that we come from a not very stable path, and you never know what's going to happen. But until today things have worked out very well, and I'm happy about it. Of course for me ‑‑ I say it every single day, but it's just the truth ‑‑for me to go out there and feel the support of the people is a very special feeling, and it gives me a lot of energy. Q. Apart from the support of the people, technically does Madrid have something that's good for you? Do you feel comfortable on this court? Does it have any special feature that suits you? RAFAEL NADAL: Well, I don't want to be arrogant, which I have never been in my whole life and I'm not going to be now. The last six years, except last year, I had also made it to the final in Monte‑Carlo, Barcelona, and Rome the majority of times. Madrid is a clay court, and I think that since three years ago‑‑ well, the courts are at the highest level on the tour. They're really well laid down. They're just perfect. That helps to see good tennis. I think that the altitude is always a factor here, but at the end of the day, it's just a clay court. 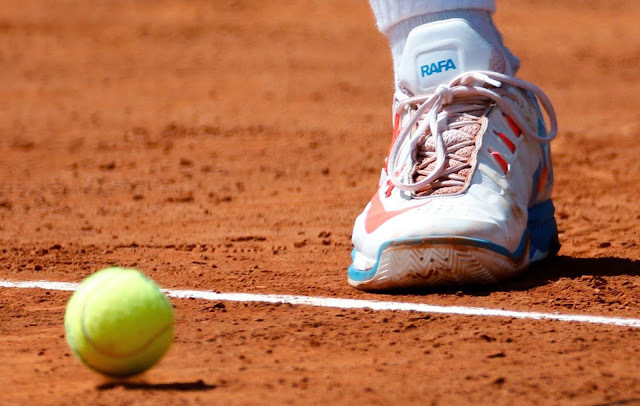 I'm not going to talk about the blue clay, which I also made it to that final. But the courts were really tricky in those days. They were very slippery and they were tough, difficult. The quality of the construction of the court in those days is not what we have today. I'm not going to talk about the blue clay. As I'm saying, from three years ago until now, there are no courts in the world that I would say are better than these clay courts we have here. No other courts. They are all the same because they are well laid down, and I think a really good job has been done here. From my personal point of view, and I think that I'm talking here for all the players, I just want to say thank you for all the investment that has been put in here. It has been really well laid down during the last years, which is good for all of the players, and especially also for the supporters and everyone. Q. You've been serving really well today: four aces, a couple serves above 200 kilometers per hour. RAFAEL NADAL: Those are not a lot of serves above 200 kilometers per hour. Q. Do you think this is important for you? Have you changed something in your serve? RAFAEL NADAL: Well, I don't know. Recently I think I've just been serving good here. In Barcelona I had three breaks in the second set and I didn't manage to finish the game on my side. So no, no, things are just going fine. I didn't lose my serve until today. It's logical as soon as you go on in the tournament the opponents have more level and you might have more problems keeping your serve. But, well, I think that I have served well in important moments. I did the right things. I did a couple of important aces. The most important thing for my game, not for everyone's game here, is a safe serve that it allows me to dominate the point. Rather than the aces, I'd rather have a good shot from a good position and I can start the point dominating. That's my goal when I serve every single place, but especially here in Madrid. Q. Just talk us through the match a bit and whether you think this was your best match on the European clay this season. RAFAEL NADAL: I don't know. I think in Monte‑Carlo I played very good matches. I played well today. I think I played at the right level, so very happy for that. Obviously much better than what I was doing the last two weeks in‑‑ last week and two weeks ago in Barcelona. Much better than the first day here. So that's great news for me. First great news is be in semifinals. It's very positive result for me. Confidence, good energy, because then when you were working hard and fighting for goals, it's great when you see that those goals are arriving. In terms of tennis, I am pleased the way I played this afternoon. Very happy. Q. Grigor Dimitrov, people still call him young, and they called him young yesterday. Q. Young. They asked you if his generation will overtake yours. The reality is they're only a few years younger than you. RAFAEL NADAL: Almost five, no? Four? Q. But Nishikori is only a couple years younger than Djokovic, for example. Do you think their achievements are sometimes overrated compared to yours? RAFAEL NADAL: Overrated? What do you mean? No, no, I think we don't have to confuse about the generations. Dimitrov, I think the Dimitrov, Nishikori, Del Potro more or less, Raonic, are from this generation. Then is another generation that is coming with Kokkinakis, Kyrgios, new names that are playing at a high level, too. But Grigor Dimitrov is a fantastic player, and he has been in a high position of the ranking for a last couple of years. He's ready to compete with everybody. He's ready to compete for the best tournaments. The competition on the tour is hard. There is a lot of players that can do important things. It's true that my generation‑‑ well, but, you know, we talk about my generation and we put Federer in my generation. His generation is five or four years older than me. Yes, five, I think. So, you know, he's a different generation, too. But we played together all these important years for us, and the real thing is we're still there. Berdych, David, Andy Murray, myself, Djokovic, Tsonga, all the players are still there fighting for the highest position in the rankings. We combine three generations today, and it's not easy for nobody. Q. You mentioned in your first answer about your goals and that you met another one today. What were your goals for this week and have you met them? RAFAEL NADAL: My goal is feel myself playing better every day. That's my real goal. Then obviously the goal is always the same: try to have the better result possible. Q. You received a time warning. Maybe it was not the best timing, right? Did it disturb you? RAFAEL NADAL: In the break point? RAFAEL NADAL: You know, I received it in a set point against, I received it in a set point against, a second warning, so I had to serve second serve. Something that is not new for me. I know sometimes I'm slow, but I don't know. Sometimes I feel that ‑‑ Mohammed is a great umpire, but I feel sometimes that the umpires are only‑‑ they are watching the watch. There are more things happening on the match that they have to take care of. I'm not talking for Mohammed, but in general, seems like since few years ago the most important thing of tennis is the time now. I played eight, nine years of my career using the same time I am using now and I receive just very few warnings for time. I really don't know who had that interest few years ago to put that‑‑ not a new rule‑‑ but to be very, very strict on that rule. I am not against, but why you have to be very strict in that rule when we are not that strict in another rules. I never, during nine years, heard an umpire, when we were at the net, saying, 25 seconds between points. Since three years ago, before every single match I heard, 25 seconds between the points from the umpire. They say the rule didn't change, okay? Something change, and I don't know who had that interest to change that. But at the end of the day, I have to be quicker, I know. The umpires have to be a little bit better on the other rules. Have to be a little bit better taking positions like last what happened in Estoril. They didn't take the right decision in a very important moment. So the things have to be fair for everybody, not only in one particular thing. In my opinion, there is another lot of worse things happening on the other side of the net sometimes that are for sure not the best example for the kids and for everybody. For sure worst example than being a little bit slower. Seems like that's not that important than being maybe five, six seconds late. So accept is always my fault. I am slower than what I have to be. But at the end of the day, the umpires have to be more strict on all the rules, not only on this one.